Stocking lake around 1955. The bare ground near the bottom is where the Singleton's house now stands. This was the site of an early logging camp. Swenson Lake, upper right of the photo. The swamp in between the lakes is where three cows drowned from the Grimley farm, located on Swenson Lake. Date, around the early 1950's. 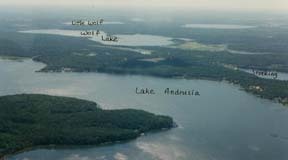 Flying over the North end of Andrusia, looking North to Big Lake.